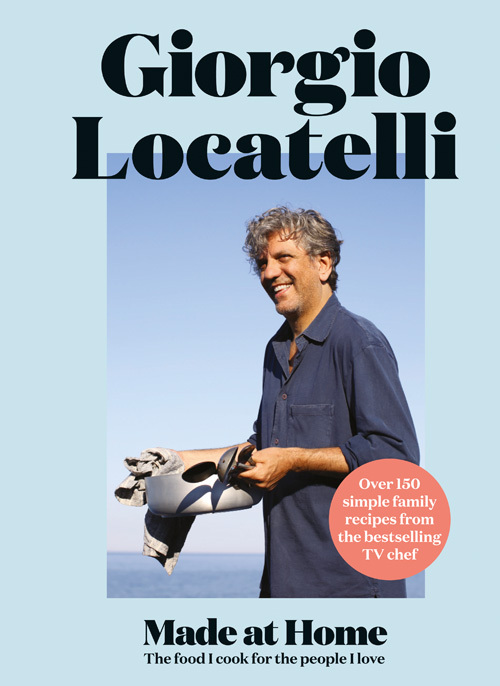 From Giorgio Locatelli’s Made At Home, we bring you two delicious ravioli recipes. 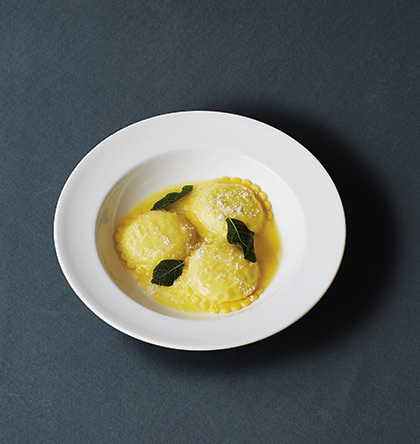 “My favourite ravioli, since childhood, is one of the simplest, filled with spinach and ricotta. Sometimes we ate out as a family at a restaurant on Lake Maggiore, where we would always have these to start, tossed in butter and sage, with a fish like perch to follow, or lavarello spaccato, the local lake fish, filleted and fried, with a piece oflemon, and chips for us kids as a special treat. There are an infinite number of shapes and fillings for ravioli. The only thing I would say is that if you have never made them before, it might take afew times to feel really confident, but what is the worst thing that can happen? You throw away your dough, get some dried pasta from the cupboard and use the filling that you have made with that instead. Don’t make your ravioli too early, make them no more than an hour before you want to serve them, as the humidity from the filling can soften the pasta, causing the ravioli to break when you cook them. I like to make quite a firm pasta dough, as if it is too soft and elastic it will stretch when it is rolled through the pasta machine, but then pull back when you are making your ravioli and become too thick. So if you are mixing the dough by hand and your hands aren’t hurting by the time you have finished, you are not doing it properly. Sift 500g of 00 flour into a bowl, then turn it out in a mound on to a clean work surface. Make a well in the centre and sprinkle in a pinch of fine sea salt, then crack in 2large eggs and 2 eggyolks. 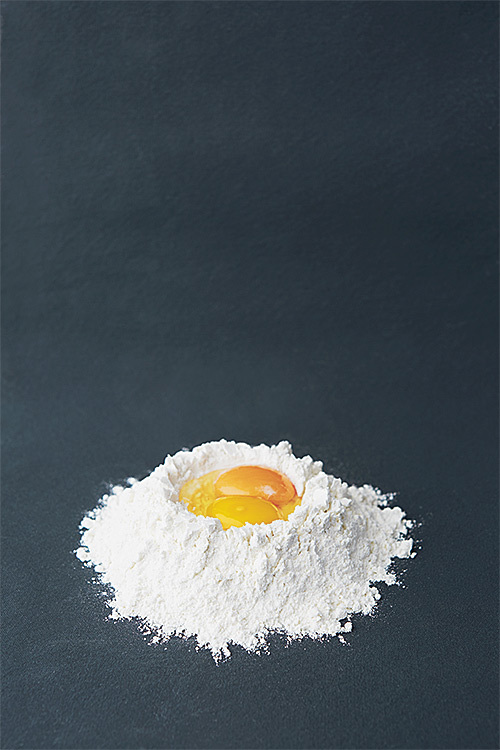 Break the eggs with your fingertips and gradually work in the flour in a circular movement until you have a dough which will come together in a ball. Alternatively, if you want to use a food processor, sift the flour into the bowl, add the salt, and then, with the motor running slowly, add the egg yolks followed by the whole eggs. Stopand turn out the dough as soon as it comes together. Now you have to knead it by pushing it with the heel of your hand, then pulling and folding it back over itself, and repeating this over again for as long as it takes for the dough to feel quite springy.Wrap it in clingfilm and leave it to rest in the fridge for at least an hour, but preferably overnight. First flatten the dough into a square about lcm thick with a rolling pin. Make sure it will go through your pasta machine easily. There is no precise number of times to put the pasta through the machine, you will need to feel your way with it,but roughly speaking, follow these steps: Feed the pasta through the machine on its biggest setting, then put it through again on the next setting down. Repeat this two or three times, then fold the pasta back on itself, in half, put the machine back on to its first setting and put the pasta through three or four more times, taking the setting down one each time, until the pasta starts to become silky. Now cut the pasta in half and cover one half with a damp cloth. Fold the other half in three: fold one end in and the other end over the top, so that it is square-shaped. Turn it through 90 degrees, then put it through the machine on the first setting again -by changing direction you build strength and elasticity throughout the pasta. Repeat a few times, taking it down a setting each time. Finally, fold the pasta back on itself, in half, one last time. Put the machine back on to the first setting and run the pasta through again, taking it all the way down through the settings until it is about l.5mm thick, shiny and see-through. Make your ravioli from this strip of pasta, before rolling the next one.Mark the centre point of the strip, then brush one half with beaten egg. 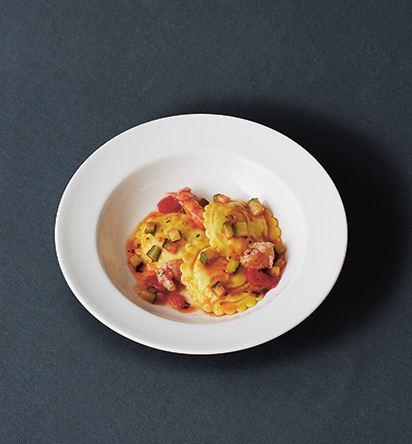 Place small mounds of your pasta filling (about a teaspoonful) on top -two abreast and with about 3-4cm between them. Fold the other half of the pasta over the top, matching the sides, and press down gently around each mound of filling. Using a fluted round cutter lcm bigger than the filling, cut out each raviolo, then gently press out any air around the filling. Repeat with the other strip of pasta. Bring a large pan of water to the boiL Put in the ravioli and cook for 3-4 minutes. Blanch 600g of spinach in boiling salted water for 1 minute, drain under cold running water, then with your hands squeeze out all the excess water. Finely chop the spinach and put into a bowl, add 600g of fresh ricotta, an egg, a handful of grated Parmesan and a pinch of nutmeg, and mix well. Taste, season with sea salt and freshly ground black pepper, then use a teaspoon to fill the ravioli and cook them as above. In the meantime melt 150g of butter in a pan and put in a few fresh sage leaves. As soon as the butter starts to bubble, add a ladleful of the boiling water from the pasta pan to create an emulsion. Lift the ravioli out with a slotted spoon and transfer to the pan of butter and sage for a couple of minutes, then serve, sprinkled with grated Parmesan. Heat some olive oil in a large pan, put in a finely chopped clove of garlic, cook for a minute, then add around 900g of large, peeled raw prawns and saute for a couple more minutes. Season with sea salt and freshly ground black pepper and add half a glass (35ml) of white wine. Bubble up to evaporate the alcohol, then add 2 tablespoons of tomato passata, take off the heat and put into a blender. Blend to a puree, then leave to cool down. Put 2 cloves of garlic on a chopping board and crush them into a paste with the back of a large knife. Put a large handful of fresh parsley leaves on top and chop finely, so that the garlic and parsley combine and release their flavours into each other. Mix half of this into the prawn puree, reserving the rest. Fill the ravioli with the prawn mixture. Heat some olive oil in a large pan, put in a lightly crushed clove of garlic, then add the courgettes and saute until soft and lightly golden, taking care not to burn the garlic. Add half a glass (35ml) of white wine and 10 quartered cherry tomatoes. Cook the ravioli as above. Lift out with a slotted spoon and transfer to the pan of courgettes and tomatoes, with a couple of ladlefuls of the cooking water. Toss through, adding the rest of the parsley and garlic.